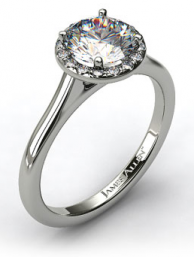 If Picasso ever designed an engagement ring, this is what it would look like. Or maybe even Salvador Dalí. It’s kind of like “The Elephants”, but in jewelry form. But not as weird. 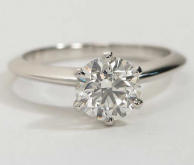 And, way more beautiful (come on, it has diamonds!). 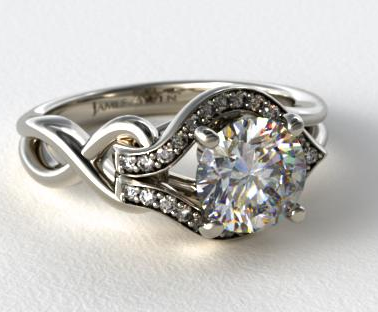 So the folks at James Allen (who designed and sell this ring) call it a “Love Knot”. 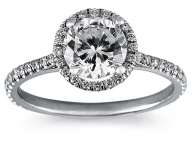 To get the full effect of this ring, click on the image above to go to their product page and look at the 360º view — it’s amazing. 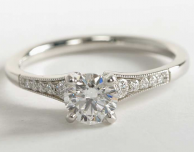 On one side of this ring, you’ll see the knot coming out of the band and hooking into the other side of the band, which holds the center diamond. 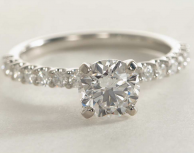 Halo diamonds wrap around the center diamond to provide extra sparkle. This description really doesn’t do it justice, though — click on the image above and look at the 360º. I love this ring and think it’s absolutely gorgeous, and it’s as unique as you can get. People will think you had it custom designed. The way the ring comes together is fascinating, as one side interlocks with the other to complete this ring as one single unit. 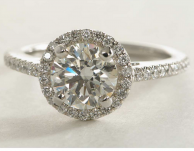 It’s beautifully artistic, and one of the most amazing rings I’ve ever seen.